...still not a camera for me, esp. as it is touch screen oriented - but at least my knowledge base increased a bit. I think that this is the camera world "dream land". Obviously the M4/3 consortium decided many years ago that the 4/3 sensor was as much as anyone needed. They consequently busied themseleves making quite a few small lenses for this format. Now they are stuck. Or at least those buying other cameras think that the M4/3 camera body owners are "stuck". I am sure that those afflicted are not so unhappy, they now have a veritable swag of lenses to choose from and some nice camera bodies. The OM-D models show that M4/3 owners are certainly not deprived. That the debate on the "aps-c" XT-1 can even get off the ground must mean that the FF sensor has not swept everything before it. Having an aps-c sensor has always been "a slightly better than thou are" attitude. Having FF sensor means attitude replaces the more megapixels race. Some thinking folks decided that their lesser megapixel cameras made images that were just good enough for their purpose. Sony has set out to ace everything by going the whole hog to FF sensor for the masses complete with much banging on gongs and clashing of cymbals but has yet to prove that there are really huge crowds watching enviously and madly saving their frequent flyer points. Your average buyer, needed to make the FF sensor a global reality, still thinks that a camera is a box that takes pictures and that an expensive camera is just a status symbol and something that takes pics at a wedding. One might even wonder if Sony were starting to despair at the market penetration of the NEX series and simply needed a big hit to difference their products from "the rest". I think the rest of the (afflicted - non FF sensor) world has figured out that the FF sensor whilst nice and quite desirable comes with some caveats. It is more expensive than average, Sony seems to be borderline capable in making a good user interface, they have wrong-footed all those who have bought into E mount lenses for aps-c sensors. And of course there are, as yet, few native FE mount FF lenses about. And those really interested in AF native lenses have commented with some apparent surprise that FE lenses are not only larger but are more expensive as well (gosh). So do we get a reaction, a turning of the tide, where many not wanting to lock themself in to the large FF sensor hole in the wallet might decide that a Fuji aps-c, or an Olympus or Panasonic M4/3 might be good enough. 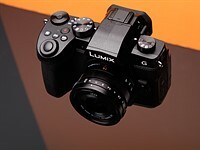 If small is beautiful and M4/3 considered good enough pixel wise then the tiniest enthusiast camera that fits both criteria is the Panasonic GM1. Of course if your budget stretches to afford an A7 type then you can get a swag of M4/3 gear to go with your GM1 for the price of a foot placed in the door of the A7 Nirvana. That is if you don't spend all your FF gear savings on a Nocticron. So am I nuts putting such an expensive lens on a lowly GM1? I think not. If the lens proves great enough then it might well bridge the image gap between M4/3 and FF. Certainly I don't think my tired old eyes will notice any diffference in my snapshots.